Cellist, conductor, and educator, Mark Churchill has appeared as soloist, recitalist and chamber music player throughout the United States and on tours of South America and Asia. He performed in Seoul, Hong Kong,Taiwan and throughout Latin America with the Trio Pro Musica. Much sought after as a teacher of talented teenage cellists, he is on the cello faculty of the NEC Preparatory School and has taught at major summer music programs including Greenwood Music Camp, Musicorda, the Heifetz and Foulger International Institutes. He was Associate Conductor of the Boston Ballet since 1992 to 2012, and is the founder and Music Director of Symphony Pro Musica, Worcester’s Salisbury Lyric Opera, and the Salisbury Chamber Orchestra. For eleven years he served as Resident Conductor and Faculty Chairman of the Asian Youth Orchestra in Hong Kong, a pan-Asian organization founded by the late Sir Yehudi Menuhin. Recently he led the New Zealand National Youth Orchestra in its annual gala concert. 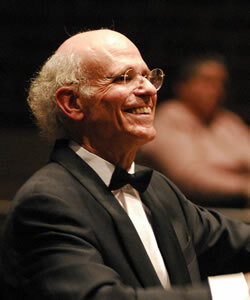 Churchill is Founder and former Director of El Sistema USA and Dean Emeritus and Senior Advisor of New England Conservatory. As Dean and Artistic Director of the Department of Preparatory and Continuing Education for 30 years, he developed and oversaw programs emphasizing serious, professional training for pre-college students and adults in addition to numerous community based programs and local, national, and international partnerships. Most recently he spearheaded both El Sistema USA and the Abreu Fellows Program at NEC, connecting NEC directly with the US’s rapidly growing music education/social development movement, inspired by Venezuela’s El Sistema and its visionary founder José Antonio Abreu. He is also the Senior Advisor of the Boston Philharmonic where he co-founded the Boston Philharmonic Youth Orchestra, one of the premier youth orchestras of the world. He is an active advocate for the improvement and expansion of music education programs in American schools. For many years he oversaw NEC’s Center for Music-in-Education, which featured the development of new music education curricula and music teacher training programs. Along with Venezuela’s José Antonio Abreu, he is the founder and vice president of the Youth Orchestra of the Americas, established in 2002, which draws gifted young musicians from throughout North and South America. In 2005 he oversaw the signing of a “Friendship Agreement” between New England Conservatory and Venezuela’s massive youth orchestral training program, El Sistema. He serves on the boards of a number of non-profit organizations including Project STEP, a pre-professional support program for string students of color; the Conservatory Lab Charter School, a K-8 public inner-city elementary school offering a music based curriculum and a fully integrated El Sistema program for all students; the Walnut Hill School, an independent school for serious high school age art students; the Quincy Jones Musiq Consortium, an initiative with the mission of bringing together, supporting, and advocating for all quality music education programs in the US; the Berkshire Institute for Theology and the Arts; and the Youth Orchestra of the Americas. Churchill holds the Doctor of Musical Arts degree from the University of Hartford and the B.M. and M.M. degrees from New England Conservatory. His doctoral dissertation research on Brazilian music was supported by a one year Fulbright grant to live and work in that country. His principal teachers include Herbert Blomstedt and Charles Bruck (conducting); Rudolf Kolisch (chamber music); and Raya Garbousova, Laurence Lesser and David Soyer (cello). He resides in Newton, Massachusetts, with his eighteen-year-old twin daughters, Emma and Julia, both musicians.